A rocking chair is a great accent for any area of the house, from bedroom to living room or family room. Add a rocker to the patio or deck for instant comfort and style. A rocking chair on the front porch is a real eye catcher and adds instant curb appeal to a period house. Children love to rock and there are many rocking chair plans made just for the little ones. Simple, child-sized chairs may be painted with bright, durable enamel, while a living room chair may be made of fine wood and finishes. Whether you choose a mission style or select from rocking chair plans that incorporate turned spindles for a colonial look, there are plans to suit any fashion and budget. Simple models are great as beginning woodworker projects, while others are more complex and require additional skills and tools. 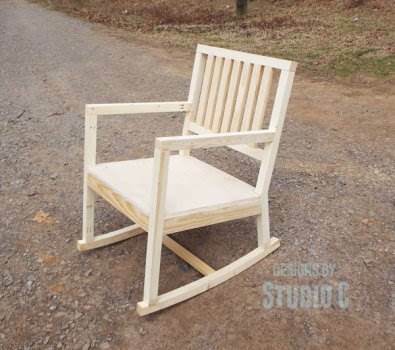 With the use of pallet wood and some hardware you can easily create this great looking and inexpensive to build rocking chair. This comfy glider is perfect for the deck or patio; it seats two and has wide armrest to sit a cold drink on. 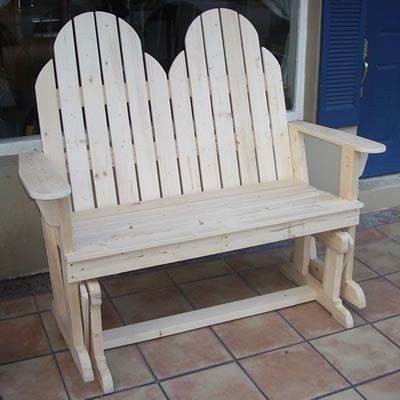 This plan uses pine wood to build a strong and sturdy rocking love seat in Adirondack style for outdoor enjoyment. This chair is built out of oak wood, has a slatted back-rest, plus a wide and deep seat for a comfortable and relaxing rocker. 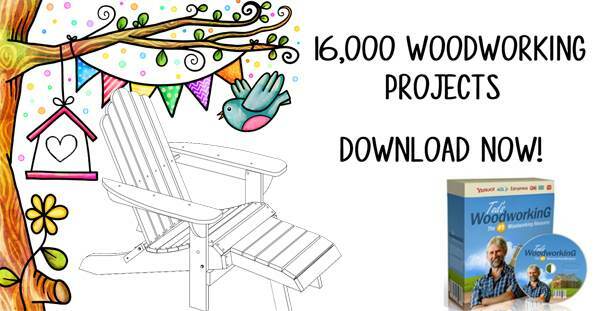 This plan will help you build a handsome wooden rocker with the use of a ripping-guide and a circular. Starting with two 2 x 6's that are then ripped into 2 x 2's plus a band saw and jigsaw you can easily create a rocking chair. 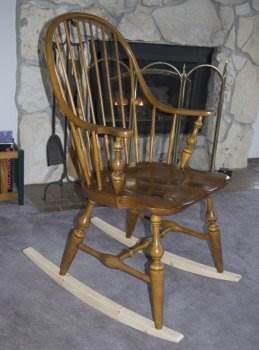 This plan takes a wooden chair and by building and applying a set of wooden rockers to the legs makes a rocking chair. 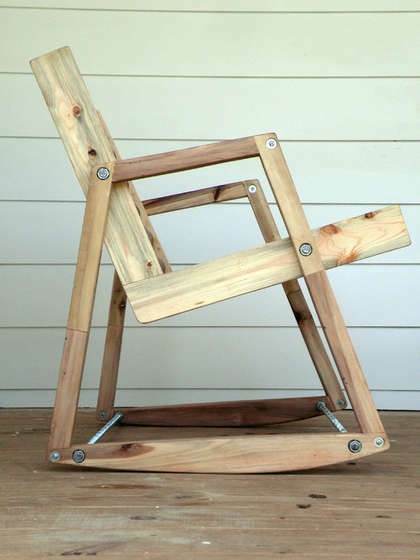 Spend a single weekend building this kid's rocker out of your choice of cedar, pine or redwood. 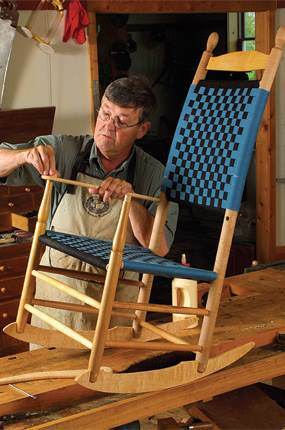 Here are easy to follow instructions on building a shaker rocking chair with a colorful woven seat and backrest. 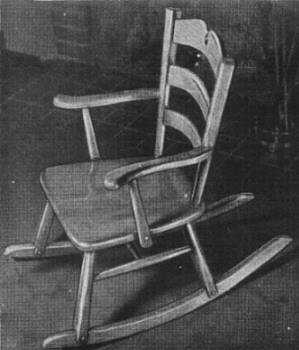 Plans for a toddler's rocking chair in early American style that can be modified to fit your child. Purchase the hardware for all your chair projects. Can't find the perfect project for free? Purchase one here. 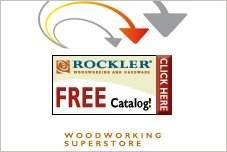 Browse all the purchase projects available from the top woodworking vendors.